The Fourth of July always has had a special place in my heart. Growing up, my dad would take me to the edge of city limits and spend more money on fireworks than intended - but it is impossible to buy just one of anything. Mom always made a flag Jello Cake with Cool Whip and fruit on top, and started me on my event planning skills early by having me do the table setup. As night fell, the entire block was sitting in our driveway - tailgates down and kitchen chairs pulled from the house for extra seating. You would think we were country folk, but this was just what it meant to celebrate July 4th in the south with my family. Fast forward a few decades, and I am still in the south but five hours from family. Instead of going home, I have decided to host a party complete with specialty cocktail, slip-n-slide and quite possibly a Jello Cake. 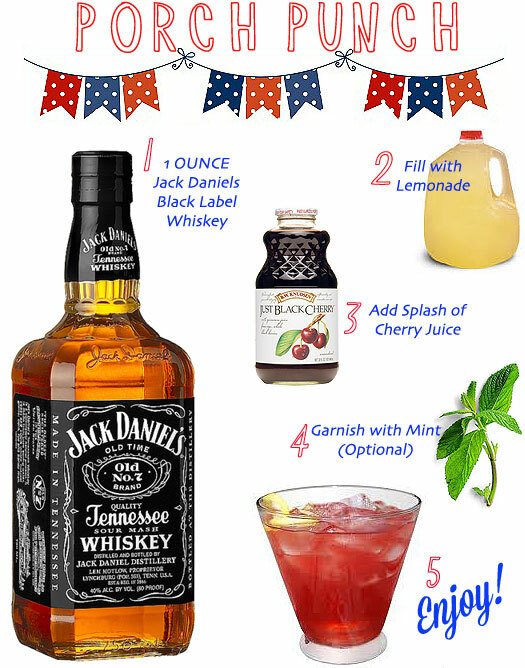 The cocktail of choice for this party is a mix of bourbon & lemonade with a splash of cherry juice. Now keep in mind that natural cherry juice is more sweetly tart than anything you'll find in a bottle of Robitussin. To make one drink, you will add 1 ounce of bourbon to a tall ice-fille glass and fill the rest with lemonade (you can combine the two in an ice filled cocktail shaker, if you prefer it colder and well mixed). Now add a splash of cherry juice, a sprig of mint and you are done! Regardless of what you will be drinking, I hope you have a wonderful holiday!